Now the curious thing is that it was never my intention to become a practicing private eye. 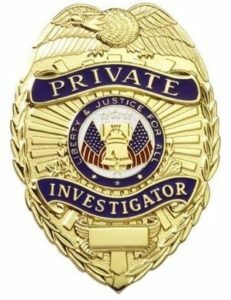 But after three courses, a deep dive in Washington State law, as well as firsthand accounts of what it’s like to be a criminal investigator and a civil one, I got swept up in the excitement. So now I’m in a bit of pickle. I’ve chosen my specialty (fraud investigation), and I’ve even started networking with people who have expertise in the field. One of my classmates, who is also a mystery novelist, chose surveillance as her specialty and suggested we go into business together. This could be fun! We are so unalike and yet compatible that our skills would complement each other quite nicely. She has as endless supply of patience (which will serve her well in surveillance); I have almost none. I have technical skills (which will serve me well in detecting fraud); hers are scarce. She wants to take the agency exam (which is required before we can open our own agency); I have no interest in sitting through another exam. 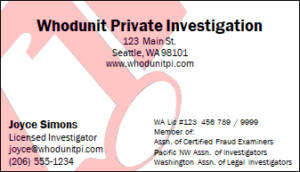 She doesn’t seem terribly interested in setting up our agency website; I already plunked down $10 to buy whodunitpi.com from GoDaddy and set up a website (www.whodunitpi.com). There’s no rush to decide whether to moonlight as a P.I. while I work on my next novel. But I feel like a path has opened up before me. Now I just need to decide whether to set foot on it. It’s an intriguing proposition. If I don’t at least try to investigate a case or two before committing to any bigger undertaking (like opening an agency), will I regret it? Strangely, sometimes you get a glimpse of the road not taken. And it feels like time stalled and threw open a window for you to peek into. I know this because it has happened to me before. Back when I was in my twenties, I dreamed of living in Paris. At the time, my written French was respectable but my spoken French was not. Nonetheless, I answered a Help Wanted ad for a translator in The New York Times. I was called in for an interview and made it all the way to the last step: meeting with the president for a sit-down in French. He told me I had passed the translation test with flying colors but my conversational skills were lacking. He was in a pickle himself because the only other candidate (whose name was Laura, I discovered, when we rode the bus to the interview together) who had made it that far had outstanding conversational skills but her test scores were lower. What to do? The answer seemed obvious: choose me! But he chose Laura. And my heart broke a little when I learned that I would not be moving to Paris. A couple of years later, I answered another Help Wanted ad in The New York Times, was flown to Seattle, was offered an amazing job, and started my new life here in the Pacific Northwest. But part of me always wondered: what if I had gotten that job in Paris? What would my life have been like? I pictured myself going to a whirlwind of parties with fascinating francophones, living in one of the most beautiful cities in the world, breakfasting on croissants, maybe even meeting someone who lived in a chateau. 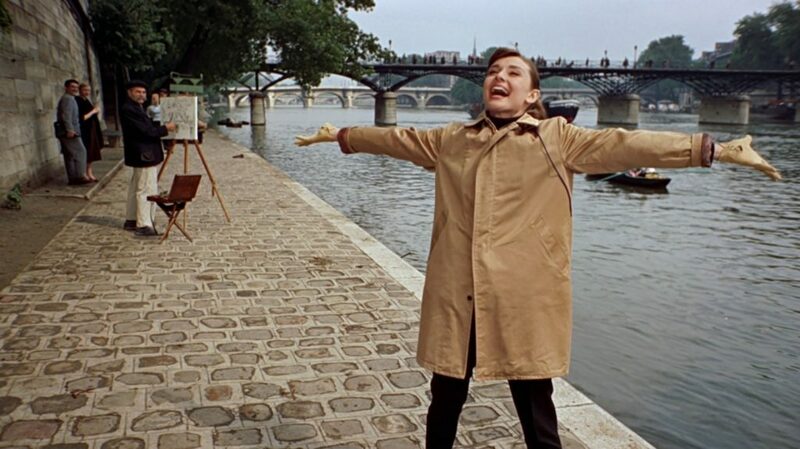 It was all very Funny Face meets Amélie meets Midnight in Paris. And then, shortly after starting my new job, I was offered the chance to go to a conference in Minneapolis. 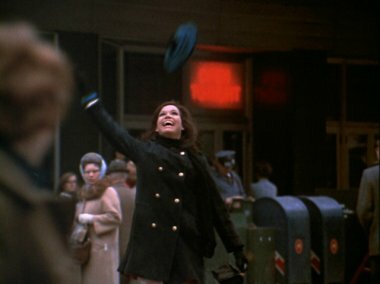 I had always wants to go to Minneapolis since I grew up watching The Mary Tyler Moore Show and wondered whether the city was anything like it was portrayed in that filmed-in-Studio City sitcom. Maybe I’d even toss a beret in the air. Shortly after arriving at the conference, I heard someone call my name. I turned around, and there was Laura, the woman who had beat me out of the job in Paris. She had come to Minneapolis for the same conference. What an opportunity! I was dying to hear about her magical life in the City of Light. I knew I’d be green with envy but I was so curious to learn what my own life could have been like. So we met up between sessions, and she laid it all out for me: she hated her job; Paris was so expensive that she had to live at the end of some metro line; she was not living the dream. In fact, did I know of any openings at the company where I worked? What a gift. Now, that’s not to say that I would have hated the job and would have chosen to live in some dodgy quartier of Paris. But life had dealt me a hand that was hard to beat: I worked for one of the most successful companies in the world; I was making friends right and left; I had a beautiful home that suited me to a T. And when I vacation in Paris, I stay in one of the chic arrondissements within walking distance of everything I want to do. 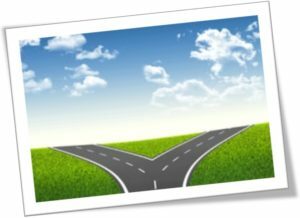 So to come back full circle, I’m not in a rush to investigate a crime or embark on a road that might not be to my liking in the end. I have faith that when the time is right, a window will open and I’ll be shown the darker side of life as a P.I. (many of my former classmates are now friends I keep in touch with). Or maybe I’ll find an immensely satisfying way to marry my interests in a way that wouldn’t be possible without a background in tech, a passion for writing mystery novels, and my newly acquired skills as an investigator. And when that happens, it’ll be something worth throwing my beret in the air about. Thanks this week go to Ingrid Thoft, who drew my name out of a bucket and made me the lucky winner of a book raffle, and ultimately helped make me a private investigator too. Waves from your “patient” PI partner. BTW, reviews on Amazon say to skip the pretty pink pee-pee device and go for a ziplock bag when on surveillance. Who knew?